Performing regular maintenance of ovens and ranges will extend their life and keep them operating at maximum efficiency. Your pocket book will benefit as well with lower energy consumption, greater reliability and less repairs. By following these maintenance practices you’ll reap all of these benefits. Clean range vent hood: Keeping the front panel, window, and outer door glass clean is important because it prevents spills from staining the panel or glass when it heats up during oven operation. 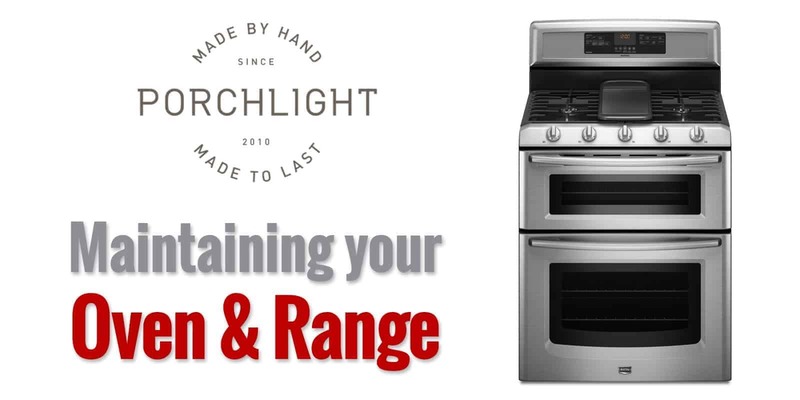 Only clean the front when your range or oven is completely cool. For spills on the front panel that are tough to remove, use a heavy-duty degreaser. Smooth electric stove top: If a heavy spill occurs, use a razor scraper to remove large food deposits. Apply a cooktop cleaner. Remove the remaining residue with a scratch-free pad and then apply a coat of cooktop protectant. Solid burner element: Some stove/ranges have heating element burners that are solid metal, there are no coils and the stove/range isn’t glass or ceramic. You can clean these solid burners using a solid surface element cleaner. Gas stove top: Some gas stove tops are made of porcelain coated steel and can be cleaned exactly the same as an electric smooth top. Stainless steel tops should be cleaned with heavy-duty degreaser and a non-abrasive pad. Take care not use too much water when cleaning, especially around the knobs. If water drips down into the holes where the knob shafts come through, the burner switches can short out and cause problems with the spark ignition system. Grates and burner pans can be difficult to clean. However, before you purchase new ones, you can try and clean them with grate cleaner. Oven interior – Self-cleaning ovens: Carefully follow the manufacturer’s instructions when using the self-cleaning function. This feature heats the interior of the oven to a temperature so high, it incinerates food particles and spills. The length of the process varies from model to model but generally lasts for 2 to 4 hours. If you’re hosting a big-cooking holiday like Thanksgiving, run the self-cleaning feature a few weeks in advance, due to risk of an issue with the door latch or an electrical component. Important: Never use a cleaning solution to clean the interior of a self-cleaning oven unless it is made specifically for self-cleaning ovens. Oven interior -Non-self-cleaning ovens: Simply wait until the oven is cool to the touch, remove the oven racks and spray oven cleaner directly onto the interior surface. Wipe with a clean rag. Oven Racks: Clean the racks in the sink. Let them soak for 10 minutes. Then, using regular kitchen sponges, scrub the racks. Most racks should not be left in an oven during a self-clean cycle as they can warp out of shape. Broiler pan: Most broiler pans are made of porcelain-coated steel that can be cleaned periodically with a non-abrasive cleaner. If the pan is damaged, replace it. Replace the light bulbs: You can replace the light bulb(s) in your range/oven; you may need to remove a glass covering or dome to reach it. Consult your owner’s manual for instructions. Most interior oven lights use a universal 40-watt appliance bulb. By putting these tips into practice, you can ensure your home appliances last longer, perform at optimal levels and save energy along the way. This can add up to significant savings and can help you manage your budget more effectively.